Cristiano Ronaldo has a new goal scoring record to add to his (very long and impressive) resume. And this one might be the best yet. The Portuguese’s goal in Real Madrid’s 2-1 win over Valencia on Saturday, giving him 367 career goals in Europe’s top six leagues. No player in the sport’s history has scored more in the continent’s best leagues. Appropriately, Ronaldo set the mark by getting away from his marker and beating the goalkeeper with a clinical header. In addition to getting to 367 career goals in the top six leagues, Ronaldo also hit the 20-goal mark in La Liga for the season. 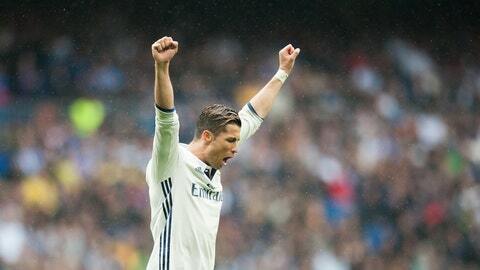 He’s now scored 20 goals in all eight of his seasons at the Bernabeu. Ronaldo scored three goals in the Primeira Liga with Sporting Lisbon, before going to Manchester United and tallying 84 Premier League goals. Toss in 280 La Liga goals with Real Madrid and you have Ronaldo’s jaw-dropping 367. Ronaldo broke Jimmy Greaves’ record, which stood for more than 40 years. Amazingly, the Portuguese’s 378 goals came in 483 appearances, which is 45 fewer than Greaves, who played for Chelsea, AC Milan, Tottenham and West Ham.